Dampers produced by Knorr-Bremse’s subsidiary, HASSE & WREDE, reduce rotary oscillation in crankshafts, camshafts and fuel pumps; they reduce noise and ensure long engine life. 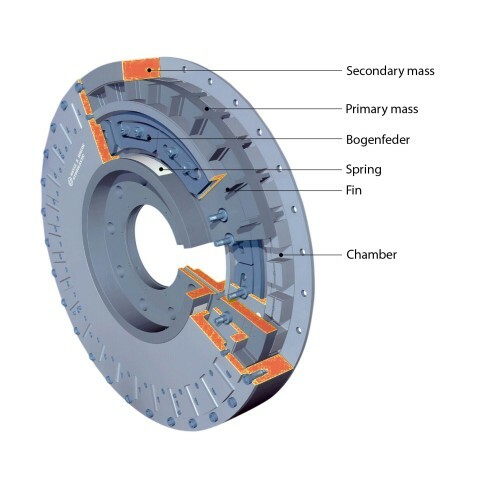 The Visco-Damper with decoupled pulley provides a compact solution for decoupling rotary oscillation between crankshaft and pulley while simultaneously reducing rotary oscillation in the crankshaft. The HYDROLASTIC damper reduces rotary oscillation in accordance with the hydrodynamic extrusion principle. 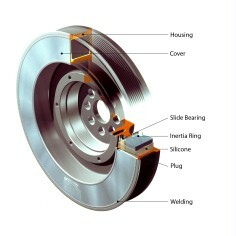 Rotary oscillation causes a relative motion in the damper between the primary mass (hub) and secondary mass (housing). As a consequence of this relative motion, mineral oil is pressed through a narrow slot. The resulting drop in pressure equates to a hydraulic drop in power, which has a damping effect.